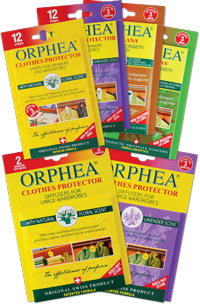 Orphea Clothes Protector strips and diffusers effectively and naturally protect your precious clothes. How? Its formulation is based on over 400 plant and flower extracts. Its fragrance gives garments a pleasantly personalised and unobtrusive bouquet. It was designed for versatility and they take up minimal space. In contact with garments, it protects them without damaging them. Guaranteed by a patented Swiss formulation. Orphea Clothes Protector strips and diffusers are blended in Switzerland using a patented formulation of over 400 plant and flower extracts from the gorgeous Swiss Alps. Its variety of unique and unobtrusive fragrances, unlike nasty mothballs, will softly envelope and protect your precious clothes and linen for 12 weeks – an entire season. They don't mark nor stain, so are perfectly safe to even tuck inside your expensive woollen and cashmere garments. Orphea Clothes Protector strips and diffusers are available at www.orphea.com.au. Take advantage of our low flat-rate postage and stock-up today! For retail sales opportunities of Orphea Natural Clothes Protector, please contact us.